1. DURABLE MATERIAL: Made of premium brass material, stable and unfading, durable and anti-rust for long term use. 2. GREAT SOUND: The drum cymbal 's sound is vibrant, crisp and loud, delivering persuasive sound quality. 3. 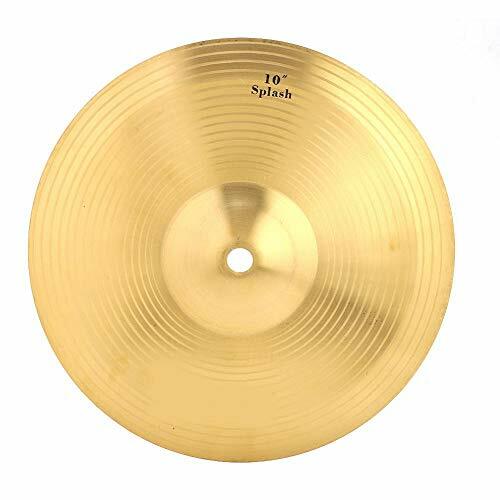 FINE WORKMANSHIP: Each brass drum cymbal is finished meticulously, classic appearance, good-looking and delicate. 4. PERFECT MUSIC INSTRUMENT: Suitable for professional music lovers, large music programs, students and amateurs. DURABLE MATERIAL: Made of premium brass material, stable and unfading, durable and anti-rust for long term use. GREAT SOUND: The drum cymbal 's sound is vibrant, crisp and loud, delivering persuasive sound quality. FINE WORKMANSHIP: Each brass drum cymbal is finished meticulously, classic appearance, good-looking and delicate. PERFECT MUSIC INSTRUMENT: Suitable for professional music lovers, large music programs, students and amateurs. View More In Concert Cymbals.